Jobs in data science abound, but few people have the data science skills needed to fill these increasingly important roles. 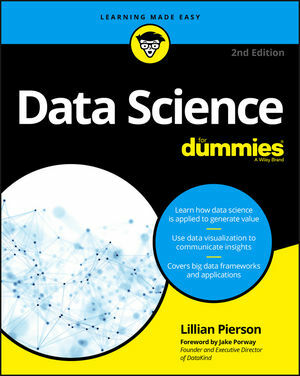 Data Science For Dummies is the perfect starting point for IT professionals and students who want a quick primer on all areas of the expansive data science space. With a focus on business cases, the book explores topics in big data, data science, and data engineering, and how these three areas are combined to produce tremendous value. If you want to pick-up the skills you need to begin a new career or initiate a new project, reading this book will help you understand what technologies, programming languages, and mathematical methods on which to focus. It's a big, big data world out there—let Data Science For Dummies help you harness its power and gain a competitive edge for your organization. Lillian Pierson, P.E. is a data scientist, professional environmental engineer, and leading data science consultant to global leaders in IT, major governmental and non-governmental entities, prestigious media corporations, and not-for-profit technology groups.